Head Coach Mike Tomlin: Boy, that’s a satisfying victory. A good, tough week for us, not only in terms of the game but from a preparation standpoint. We had some guys that had to step up, obviously. Guys like Guy Whimper, guys like Jarvis Jones and Jason Worilds, obviously playing without [LaMarr] Woodley in that mix. I just liked the efforts of all parties involved. Obviously, we were going to be tested and that’s a good football team. We did some things to shoot ourselves in the foot. We got penalized a little bit there on offense. We didn’t convert some red zone opportunities. It minimized the things that we had going there in the first half, specifically. Defensively, I thought right there at the end of the first half we just were defeating ourselves. We weren’t where we needed to be, we were bleeding a little bit, they got some points on the board, but to the guys’ credit, we got in here and gathered at the half. Guys didn’t blink. We made the necessary adjustments. We came out and played a good thirty minutes of football and did what was necessary to get the victory. We’ll take it and move forward. Obviously, we’re excited about it, but obviously there is no time to wear our hands out patting ourselves on the back. We’ll get rested and we’ll be ready to move forward. On the injury front, Emmanuel Sanders hurt his right foot in the game and is being evaluated. We’ll see where that goes. Stevenson Sylvester has got a right hamstring, we’ll see where that goes, and the rest of it was normal bumps and bruises associated with playing. Why not start the game with more guys than just one on Calvin Johnson, and what went into your adjustment at the half? That was not the case. In many instances, we allocated two guys towards him. But like I said at the top of the week, we weren’t reinventing the wheel here. There have been guys allocating him every week this year and his performances have been similar to that. So, we’re like everybody else. What were you able to do in the second half to limit Johnson to no catches? It might just have been what they didn’t do. That guy is an awesome football player. What does this game, and specifically the second half, tell you about this team? We did what was required to win today, and that’s significant. But I’m not going to paint with a broad brush and look for anything that’s maybe not there. I appreciate the efforts today. It was required under the circumstances. We did the job. We’ve got a big time wideout of our own. Not a lot was written and said about him, of course, leading up to the game. But we think he is capable of affecting the outcome of games, much like their guy. Do you think it motivates a player when an opposing player is talked about so much? I think anything can be a motivation to players, it just depends on what they’re looking for. Competitors like these guys, they search for low hanging fruit that is just that. Why so much quarters defense today, even against their base offense? Because that was the nature of the way that they attacked. Even when they’re in two tight end sets, that second tight end is an oversized wide out. He’s a vertical threat and that’s the way we chose to play him. It helped us, I thought. Obviously, it put some stresses on some secondary people that can play in the box in regards to some of the run game, but the run game wasn’t going to beat us. We couldn’t let these guys throw the ball over our head, particularly to [Calvin Johnson] and some of those other big body eligibles they have. You said you don’t want to paint this game too broadly, but do you think beating a team like a first place team kind of gives your guys a sense of something? No. I don’t want to play ball. What can you say about your offenses resiliency, especially on the long drive? It was required, but the big thing – we stalled there a little bit and started settling for field goals. We weren’t operating in the red area and we addressed it at the half. I thought they made the necessary plays to put seven points on the board in the second half when we had to. Obviously, having to settle for a field goal when we were down there on the one early in the second half was not a positive thing, but they were resilient and they stayed the course. Can you talk about the play of Ben Roethlisberger after the week he had with the rumors? I don’t play ball with the rumors. That’s not within our control. He had a good week’s preparation. We knew we were playing a good football team, a team that’s capable of ringing up the scoreboard. We realized that would require us to do similar things. I just thought he did a nice job administering the offense. In the no-huddle, is Roethlisberger calling a lot of that? It depends on the circumstance. Obviously, we have player to coach communication and it’s available to us and we utilize it, but it’s usually a mix-and-match of several people in terms of getting the offensive calls executed. 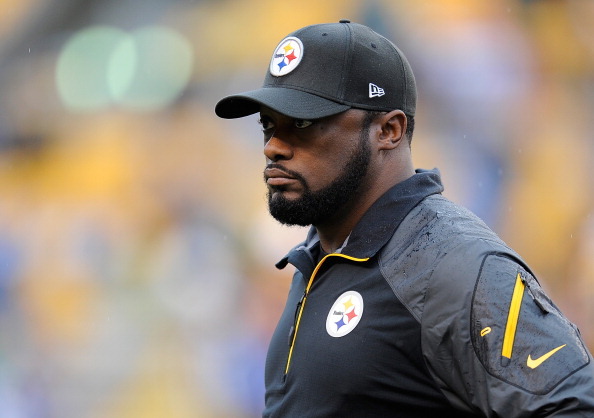 Be the first to comment on "Mike Tomlin’s Post Game Press Thoughts After Beating The Lions"